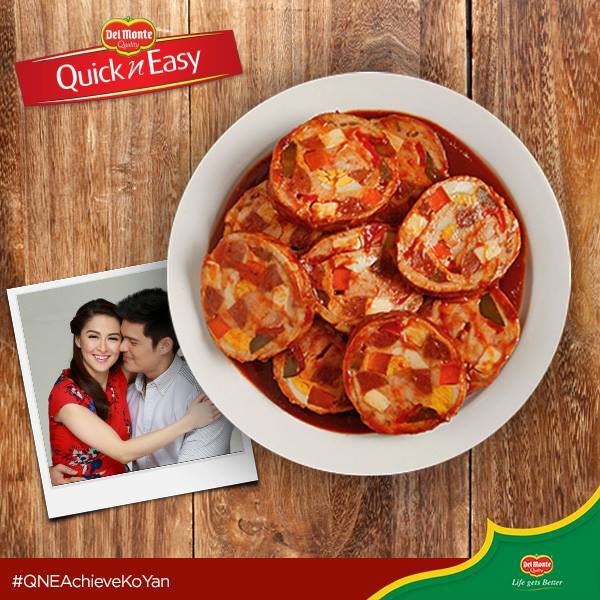 Morcon is not as complicated as you think when you cook it with Del Monte Quick n' Easy Mechado Sauce. Cook up this delicious dish for your family for tonight. 1. Flatten pork with mallet then, sprinkle with calamansi juice and soy sauce. 2. Starting on one end of the meat, arrange stuffing in alternate rows, then roll the meat and tie with string. 3. Sprinkle with flour before browning all sides in 2 tbsp oil. 4. Transfer to a saucepan then add Del Monte Quick n Easy Mechado Sauce and 1¼ cups water. Cover and simmer for 30 minutes or until tender. To serve, pour remaining sauce over sliced morcon.